It’s that time of year again when Ponca City Main Street presents “Goblins on Grand,” the annual community Halloween carnival. 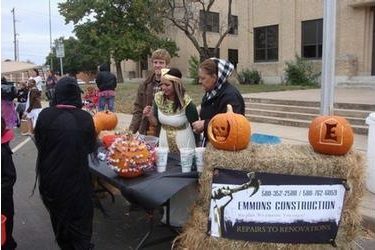 Each October, Main Street organizes this event which takes place on the grounds of City Hall and in the adjoining street area from Fourth to Sixth Streets. This year the carnival will be held from 5:30 to 7:30 p.m. on Thursday, Oct. 25. Each booth operated by volunteers will be decorated with a theme and supply candy or small toys as prizes for approximately 2,000 children. Participants may begin setup at 4 p.m. and will need to be finished setting up by 5 p.m. at the very latest. This is a pet free and smoke-free event. Get your wristbands at our drive-up pre-sale event Wednesday, Oct. 24, from 2 to 6 p.m. at the Veterans Plaza! Drive up and we’ll run them out to your car! $2 per band. Please have exact change! Sixth and Grand – at the event entrance. Wristbands, which serve as entry tickets, are $2 per participating child, regardless of age. All bands will include a trick-or-treat bag for candy and prizes. If you purchase your band in advance, you will receive your trick-or-treat bag the night of the event. You can also bring your own trick-or-treat bucket or bag if you choose.